Dr. David A. Fern, M.D., F.A.C.S. 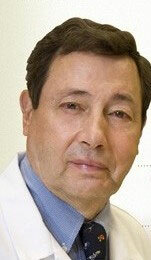 Dr. David Fern is the founder and medical director of Vein & Skin Laser Center. He is double board certified: by the American Board of Surgery and by the American Board of Venous and Lymphatic Medicine. He is in the charter class for ABVLM, which included only 248 diplomates nationwide. He has received certification for the treatment of varicose veins using VNUS Closure radiofrequency and has also received certification for skin laser treatment. He has been involved in the treatment of skin diseases, skin cancer, melanoma, breast cancer, and vein surgery for 30 years. His training in general, cancer and trauma surgery has required his proficiency in the diagnosis and treatment of vascular and skin injuries. A native of Atlanta, Dr. Fern attended Druid Hills High School. He was a Mechanical Engineering graduate of the Georgia Institute of Technology. He graduated from Emory University Medical School. After attending medical school, Dr. David Fern continued his specialty training in general surgery at Emory University Hospital. He then practiced in the United States Army under the Berry Plan for two years prior to starting in private practice at the DeKalb Medical Center. Dr. Fern is on staff at the Northside Hospital and the DeKalb Medical Center, where he has served as Chief of Surgery and has been Chairman of the Peer Review Committee for the last 25 years. During this time Dr. Fern received his second specialty certification in treating vein and lymphatic disease. Putting his background and skills to benefit the common good, Dr. David Fern is proud to be one of four physicians to travel to Kenya with Heart for Africa, a volunteer humanitarian organization serving Africa’s widows, orphans and underprivileged residents. He received the Hero Award from the DeKalb Medical Center in October, 2008. In addition, he was also awarded the Julius McCurdy Citizenship Award by the DeKalb Medical Society at their January, 2011 meeting.